CosmoBC.com » EduBlog » General Education » How to Excel in Academic Challenges? Exams are academic challenges that you cannot ignore and regardless of the type of examination you are preparing for, there are a few tips that can help you to equip yourself better for the final day. It is a well known fact that exams are inevitable, so the only option you have is to do your best without bothering for the outcome. This is because if you have performed well, it is bound to show up in your academic report card. In this write up, we will discuss about few guidelines that will help you to prepare better for your examination. So, delve deeper into the topic. Whenever you are preparing for any examination, it is important that you are passionate about the subject and have an urge to excel in whichever subject you take. Here we assume that you are taking a competitive examination. Follow these education tips for students for better performance. If you are appearing for an examination, it is important that you know the nature of the test in detail. For instance, you ought to know whether the question that you have to answer is objective or subjective in nature. Most importantly, you should also be aware of the scoring system (the qualifying marks), or whether it is grade system etc, how will you be placed once you qualify in the exam so on and so forth. Laying your hands on the right set of study material is crucial and will to a great extent determine the chances of your success. As such, once you have the study material at your disposal, organize it well so that you know which subject or part has to be read first. There are several professional tutorial/training centers that will help you to follow the right direction as far as studying the course curriculum is concerned. Not only that these centers also help students by allowing them to practice numerical and statistics based subjects for better understanding and grip. It is always better to know the type of question that you are likely to face in the examination. As such, go through question papers of the previous years so that you not only can practice them but also can prepare yourself in accordance. Examination does not always mean you have to stay glued to the books. This is one of the most vital education tips for students. Assign time for studying. Your gut health is important, although it may sound funny. Unless you feel good health wise, you will not feel good to carry out any work. And studying is definitely a far cry. So, avoid junk food and drink plenty of water to stay hydrated and maintain proper health prior to taking the plunge that can decide your fate. There is an old saying “All work and no play make Jack a dull boy”. To keep up with this old phrase, before exams, it is equally important to indulge in some recreational activities. If you wish, you could watch your favorite television program or chat with friends over the internet, or play a game of chess or basketball. The choice is yours. 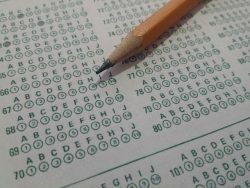 Last but not the least, if possible you can organize a mock test. Ask your friends appearing for the same exam to come over to your place and you could ask your parents to play the examiner and take a mock test. The main advantage of a mock test is that you can time your answers and you know exactly how much time you should devote to one particular question so that you don’t have to leave out any question in the last minute.